Called Audience Insights, the dashboard can provide information about a variety of characteristics, categorized into demographics, interests, lifestyle, purchasing behavior, TV viewing behavior and mobile footprint. The dashboard can help you decide how to target potential customers on Twitter. For example, you can learn about what products they’ve recently purchased, their favorite trends or what types of shows they watch on TV. It’ll also help you to choose which medium is best for reaching your audiences, such as an image or Vine loop. You can also learn what platform your audience uses most, so you can cater your ads to iOS or Android. 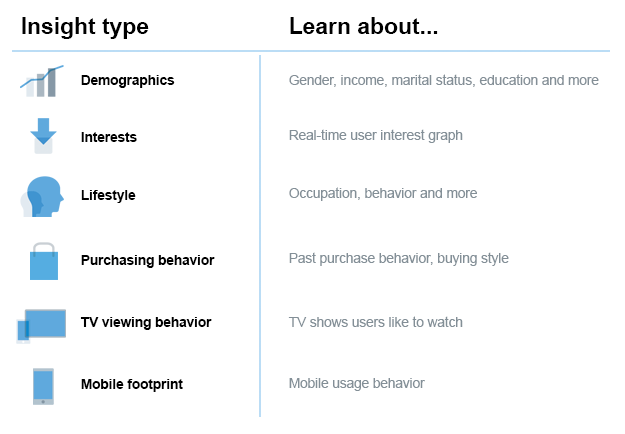 Twitter says Audience Insights are available to any advertisers or analytics users. Although Twitter-specific information is only provided in the US, the company says it will roll that feature out more broadly in the coming months. You can see information about your own audience by going to ads.twitter.com and selecting Audience Insights from the Followers menu. Alternatively, go to analytics.twitter.com and click on Followers.